Snow on the runway of Stansted Airport has grounded hundreds of passengers who have been forced to sleep in the terminal buildings, it is reported. As many as 300 stranded travellers had to wait in the arrivals hall at the London airport, with many taking to social media to voice their frustrations. Joe Allen, who had been waiting more than five hours for his Ryanair flight which was still positioned on the apron, posted a video of a packed arrivals lounge at around 4am on Thursday, December 28. A tweet from Sophia Sleigh, on her way to Bulgaria to celebrate New Year's Eve, reads: "Hundreds of people waiting for baggage from cancelled flights from Stansted Airport! What a shambles @Ryanair I feel sorry for the elderly and those with kids. Incredibly stressful and expensive time to travel. Next available flights not for DAYS apparently..."
Meanwhile, Samir Hussein called the airport "a disgrace", adding: "Waiting for baggage for 3 hours & still told no idea when it will arrive. This follows 4-hour flight delay arriving at Stansted due to small amount of snow. Thousands in the same situation in baggage hall." 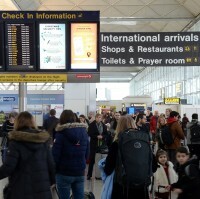 A London Stansted spokeswoman confirmed that dozens of Ryanair and easyjet flights had been cancelled. She continued: "Passengers unable to return home are being looked after by Stansted Airport with beds and blankets, and additional help for elderly passengers or those with young children. Free food and drinks have been provided to delayed passengers throughout the day." However, this has been disputed by some people, with Lucy Weyinmi tweeting: "Definitely no blankets or food or any support for passengers who have been stuck here for 8 hours plus...."
The Stansted spokeswoman continued: "All passengers due to travel are advised to check the status of their flights with their airline before travelling to the airport." Travellers can protect against unexpected cancellations and delays when taking overseas trips and holidays by taking out comprehensive worldwide travel insurance.